We all know the holidays aren't the easiest time to stick to our guns when it comes to healthy eating. Between family dinners brimming with all the comfort food we could ever dream up and the cold weather urging us to cozy up with a big dish of all the things we know we shouldn't eat, Thanksgiving is especially rampant with temptations to steer us off our healthy course. Though Thanksgiving does call for a generous serving of everything that's on the table, that doesn't mean we can't find healthy options to integrate into our dinner lineup. As always, Pinterest is chock-full of creative recipe ideas to serve up for the big day, and a trend toward healthier eating is clear. Last fall, Pinterest users saved 9000 "healthy Thanksgiving" pins per day, and the site features endless inspiration for vegan and gluten-free options to accommodate guests. 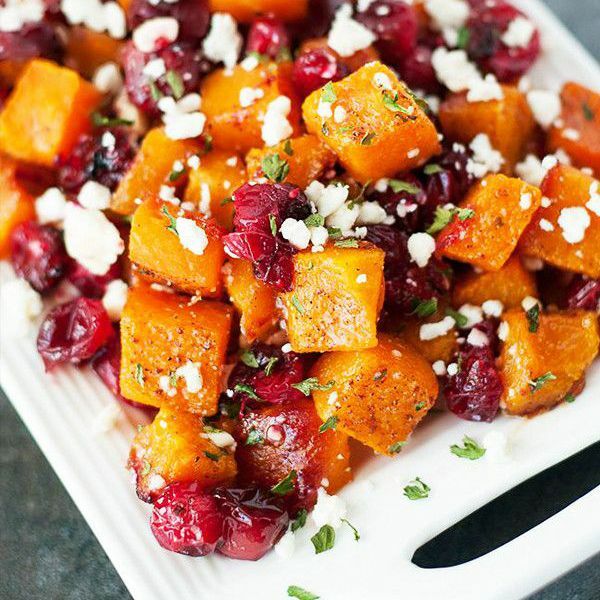 We've gathered our top three Pinterest recipes that have us enticed this holiday season. One healthy Thanksgiving recipe boasts a whopping 180,000 collective shares. This Thanksgiving, serve up some healthy deliciousness thanks to Peas and Crayons, Plain Chicken, and The Healthy Maven. Preheat oven to 400°F and lightly drizzle baking sheet with olive oil. Add the cubed squash to the sheet and drizzle with olive oil again. Sprinkle a light layer of salt, pepper, and garlic powder to taste preference, and then roast in the oven for 25 minutes. After 25 minutes, add the cranberries to the roasting pan and cook for 10 to 15 minutes, until they have started to soften. Remove from oven and sprinkle with cinnamon and add the feta and honey. Preheat oven to 425°F. Toss all ingredients together and spread out on a baking pan. Then bake for 20 to 30 minutes. Pulse cauliflower in a food processor to create rice. Heat olive oil in a large skillet over medium-high heat; add onions, garlic, and celery; and sauté for 5 minutes. Add cauliflower and cook for approximately 10 minutes; then add mushrooms and continue cooking for another 5 minutes. Finish with pecans, spices, and vinegar. Have a healthy Thanksgiving recipe of your own? Share what you plan on cooking up this year.